Positive psychology (commonly referred to as positive psych) is a relatively new phenomenon at Milken Community Schools. In just the last academic year, Dr. Nick Holton taught Milken’s first ever Positive Psychology class. 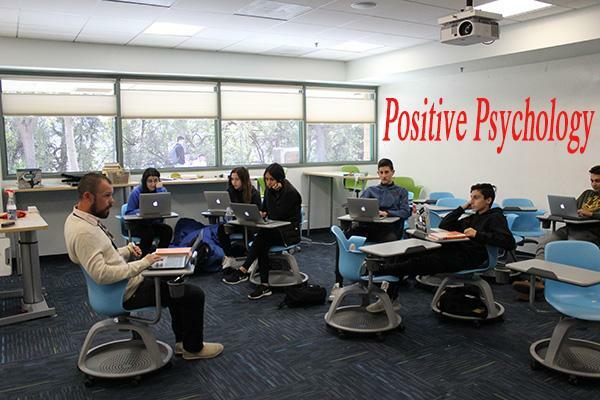 While the course itself is only in its fourth semester of study, the topic of positive psych is growing at such a rapid rate that many members of the Milken community, students and faculty included, are beginning to see an impact on the operations of the school outside of Dr. Holton’s classroom. This growth began with the creation of the positive psychology class, which has quickly become one of the most sought out courses amongst students in the short time that it has been offered. Dr. Holton tells The Roar that there are multiple aspects drawing students towards the subject, but noted one incredibly simple appeal of positive psych: “We want to feel like life is enjoyable. We want to feel like life is meaningful.” To Holton, this desire to find meaning in students’ lives is increasing as Milken students’ frustration with the grade-centric focus of academic life mounts. He’s observed many of those who have taken the class, or who have shown interest in doing so, to see that “one-dimensional thinking, specifically relating to grades, doesn’t dictate who [they] are. It doesn’t dictate their well being.” In positive psychology, students have found a science that he says “paints a fuller picture” of their lives and the things that hold most meaning to them. The popularity of the course has brought a wave of students who are actively participating in behaviors which the class teaches are most beneficial to living a more meaningful life. With a growing number of students bringing aspects of positive psych into their life comes fertile ground for fostering a relationship between the larger Milken community and the teachings of the subject. Dr. Holton pointed out several ways which most Milken students have interacted with the concepts of positive psych, such as activities within each grade. For example, the Class of 2018 recently built what Holton calls a “gratitude wall” in their area by writing out the things they were thankful for on Post-It notes and placing said notes on a wall in their grade area. The school-wide application of positive psych is only getting started, though. Milken is fostering deep relationships with worldwide leaders in the field in hopes of shaping the way the school goes about ordinarily practical business. For example, Milken has been working with the University of Pennsylvania, widely considered the leading institution on positive psych in America and home to the founder of positive psych, Dr. Martin Seligman, to educate the faculty and staff in positive psychology as it relates to education. This move, Milken hopes, will help educate each student in effective manners developed through positive psychology.